The modern Town Hall building occupies a central location just off the High Street. It has a large main hall with stage area and gallery seating accessed by lift. Local groups make regular use of the building to stage drama productions, musical concerts and pantomimes. The foyer is an ideal venue for exhibitions and incorporates a bar and kitchen facilities. 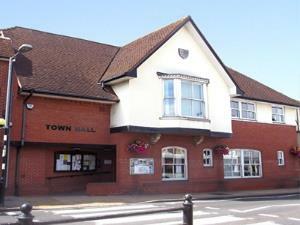 The Town Council offices are housed in the upper storey, where meeting rooms are also available for hire. The main hall has capacity for 200 seats theatre style, whilst the Conference room can accommodate 40 in class room style, 20 for a board room meeting. Projection equipment is available to hire. Fees and charges on request.